Stylistically the cold Russian film Elena and the perversely American film Killer Joe couldn’t be further apart. Yet they both are prime examples of neo-noir and in their own unique ways wallow in the melodrama of the downtrodden. In Elena, the title character (Nadezhda Markina, a modicum of pent-up middle-aged rage) trudges through the routines of her day in her posh Moscow penthouse living with the wealthy husband she hooked ten years ago when she nursed him back to health. Her son is the epitome of the post-Soviet downtrodden, living in a trashy tenement tower underneath the shadows of nuclear silos with his lazy teenage son, do-nothing wife and an infant. He begs his mother for money constantly, and she eventually becomes obsessed with funding her grandson’s college education even though we all know he’s not college material. Her husband refuses to continue to support her loser family, even though he continues to dutifully spoil his own screw-up of a daughter. When he has another heart attack and decides to revisit his will, Elena must resort to desperate measures. Suffice it say – things get dark – and…end well? Director Andrey Zvyaginstev (who previously crafted another tale of dysfunctional family relationships in The Return) utilizes the impeccable cinematography of Mikhail Krichman to create slow-moving, long Tarkovsky-esque shots marked by expert framing of characters doing mundane tasks. It’s used to build suspense along with Philip Glass’ pressure-cooker of a musical motif – because as often as we are shown the monotony of passing time – a lot happens in this film. Lives are changed – at least on the surface when it comes to money. And while Zvyaginstev seems to hint at a bit of compassion in his own cold Russian way, we the viewers know it’s probably not going to be change for the better. No matter how well-intentioned Elena is, whether it’s her dope of a son spitting from his poorhouse balcony, or her punk of a grandson spitting from her penthouse deck, they’ll always be trash looking for trouble. Speaking of trash, waltzing into the same art-houses as Elena comes the crass, brash-talking, southern-fried, Texas trailer park set Killer Joe proudly sporting a well deserved NC-17 rating. A moron (Emile Hirsch, naively thick-headed) in deep with some cowboy dope-dealers cooks up a preposterous plot with his even stupider father (Thomas Haden Church, hilariously deadpan) and amoral stepmother (Gina Gershon, looking like hell and relishing in the camp) to kill his worthless mamma for some insurance money. They hire a detective who does side jobs named Killer Joe (Matthew McConaughey in a shockingly perverse performance where he is as politely menacing as he was politely funny in Bernie) to do the deed, but he insists on a retainer – in the form of the family’s slow-witted and emotionally damaged daughter Dottie (Juno Temple, looking like a young Renee Zellwegger). Suffice it to say, things don’t go so well. Ancient director William Friedkin (who attempts to do here what Sidney Lumet did so brilliantly with Before the Devil Knows You’re Dead) utilizes cinematographer extraordinaire Caleb Deschanel to dress this scum up to the nines in Texas-flavored noir aesthetics. The film is adapted from a play by Tracy Letts and is as misanthropic and darkly comedic as they come. It’s also scary as hell in some parts – remember, Friedkin is the guy who gave us The Exorcist. There’s a moment late in the film, after a mondo-bizarre scene with a fried chicken leg that will turn you off from the bird for sure if Chick-fil-A hasn’t already, where McConaughey is allowed to go buck wild in a psychopathic rage, turns over a kitchen table and then crouches like some mad ape screaming at the top of his lungs that he will rip the faces off of those cowering against the wall. It’s enough to give any viewer chills. While operating at two ends of the neo-noir extremes, Elena (cold and psychologically probing) and Killer Joe (hot-blooded and physically bruising) both leave viewers frustrated despite providing their own signature appeal. Elena ends with no sense of justice and a feeling that these fools will just keep screwing up. Killer Joe ends literally in mid-climax where you can only imagine (nay – hope) the trash is just swept beneath the blood-soaked carpet. I urge thoughtful viewers to proceed with caution, but enjoy both films, if you must…if you can. This entry was posted in Art-house Cinema, Movie Reviews, Movies, Psychology and tagged Andrey Zvyaginstev, Caleb Deschanel, Elena, Emile Hirsch, Gina Gershon, Juno Temple, Matthew McConaughey, Melodrama, Mikhail Krichman, Moscow, Nadezhda Markina, Neo-Noir, Philip Glass, Russia, Texas, Thomas Haden Church, Tracy Letts, White Trash, William Friedkin. Well David, I have seen both films, and have reported back to my own site with my observations, with KILLER JOE talked about just last week. 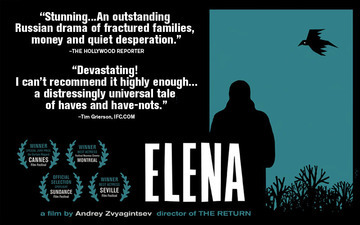 Zvyaginstev is a major talent, and one of the finest contemporary Russian filmmakers (I count myself as a big fan of THE RETURN) and you have done a great job framing both the artistry and the frustrations that result in a viewing of ELENA, though as you I was quite impressed by Krichman’s clinical photography and Glass’ brooding score. Yeah it is a tough movie to warm up to, as seemingly justice is not served, but it makes a valid point about a comparatively indifferent system. As far as Friedkin’s KILLER JOE, I’d agree it deserves that white trash headlining. It’s a disturbing film (the depraved behavior in the kitchen and the excessive violence are tough to take) but as you subsequently note in your trenchant review of both films and how they offer up interesting points of comparison, it’s also a riveting film. And it boasts an amazing (and surprising) performance from Matthew McConnoughy. Sam – I enjoyed The Return quite a bit, too. I just wish there had been a bit more to Elena – I mean the cinematography and the score….they were perfect…but there was something missing…like a payoff. I don’t know. It was a good film, though. Killer Joe, well, that is what it is…LMAO. M.McC was off the chains – I didn’t know he had it in him. Boy, Matthew M. sure is having a wild and diverse career, and he seems to embody white trash particularly well. You can take the man out of Texas but you can’t take Texas out of, etc. etc. I recently watched him in the nearly unwatchable ‘The Texas Chainsaw Massacre; the Next Generation’ (with the Oscar-certified Rene Zellweger!) and I hear he’s made a comeback (from what?) in ‘Magic Mike’, which I haven’t seen. 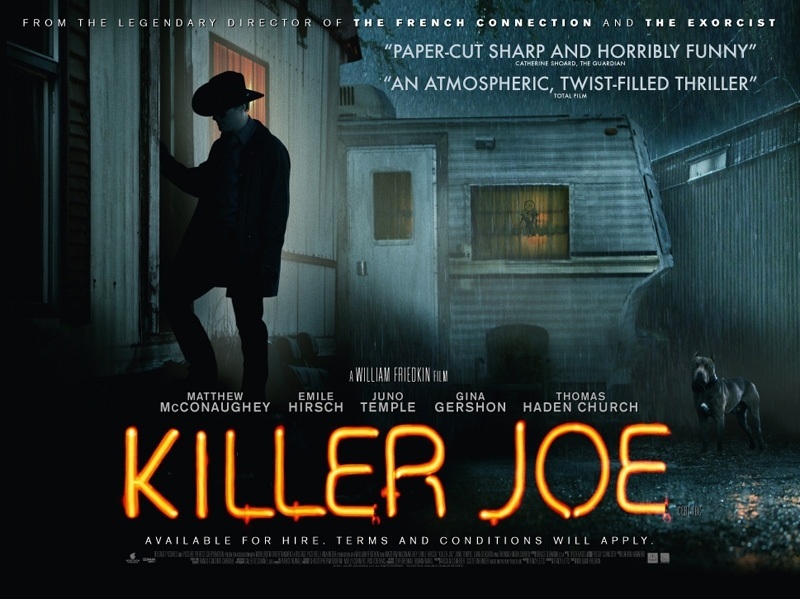 If the violence isn’t too sickening, I’ll probably take a crack at ‘Killer Joe’. McConaughey was great in Bernie this year too – very funny – and a much lighter dark comedy than Killer Joe. The violence in this is pretty brutal but not non-stop (Friedkin is very selective and knows about pacing). The tone of the film is the most disturbing part – but if you like that kind of thing (like I do), you’ll “enjoy” this.